The best car seat advice compiled in one place to help you get the right seat for your new baby. In one of the first pictures I ever took of my daughter, she is bundled in her car seat with the straps buckled just right and the chest clip positioned just so, a tiny new thing in a mammoth carrier. I had been lucky to inherit an infant car seat in pristine condition from my sister (no stains, no scuffs, no Cheerio dust). But now I’m in the market for a new infant car seat and I’ve spent hours reading articles about them. Here’s a helpful list of these articles, an annotated bibliography of sorts, that will save you hours of work as you do your own research on infant car seats. I searched for infant seat comparisons, safety ratings, and customer reviews. I visited manufacturer websites as well as marketing materials from third-party vendors. Initially, I had a shortlist of seats I was interested in (Chicco Keyfit 30, Nuna Pipa, Nuna Pipa Lite, Uppababy Mesa) and as I did my research I refined that list, adding and subtracting. Ultimately I narrowed my list down to my top 2: an updated version of a tried and true favorite (highly rated) and a luxurious car seat that fits my new stroller perfectly (that also has high safety ratings, but also a higher price tag). I was concerned with safety, price, aesthetics, comfort, and convenience. You’ll find the sources that I found most helpful below. Always exhaustive in their testing, I love Baby Gear Lab as an authoritative, research-backed source. They truly strive to provide parents with the best car seat advice, whether you’re looking for an infant seat, convertible, or a booster. When at first I thought I didn’t want another Chicco Keyfit, their review which calls it the “best overall option” put it back in the running for me. They didn’t review the Nuna Pipa, which was one of my top three contenders. This is a great place to compare different models side by side and see their pros and cons. I love Lucie’s straightforward tone and her personal voice. Prior to reading this article, I did not know that she is a certified Child Passenger Safety Technician. I definitely trust licensed CPSTs to give the best car seat advice available. Reading her infant car seat reviews, I get a sense that she’s really familiar with the different models and their quirks. Her rave review of the Uppababy Mesa in Henry made that car seat a top contender for me. Lucie is well-regarded and really knows her stuff! These aren’t safety ratings but they’re the only type of ratings the NHSTA releases on car seats. Lucie’s List remarks that CPSTs often look at these ratings as a joke because some of their favorite seats are rated poorly, but I did find this data interesting. I’ve learned so much about car seat safety from following The Car Seat Lady. She is my all-time favorite resource for the best car seat advice. Reading her articles taught me all about why we should rear face as long as possible. She has amazing resources about how to choose a family car (not an easy process!) and which even has an affordable car seat & stroller buying guide. I was initially interested in the Nuna Pipa Lite (overthinking about carrying a baby up a few flights of stairs while also wrangling a wiggly toddler) but her blog post steered me away. If nothing else, check out her blog to learn how to safely buckle your child into a rear-facing car seat. This is where I found an amazing list of convertible car seats that take up the least amount of legroom. Every time I ride in the passenger side in front of my child in a backward-facing convertible car seat, I think about this issue. We have the Maxi Cosi Pria 85, which takes up the least amount of legroom at 31” inches. I flirted with buying a convertible right away, but I’ll stick with an infant car seat for the first year. The Baby Cubby is a great baby boutique that also produces tons of helpful content for new parents researching baby gear, including some of the best car seat advice. I love their article about How to Choose The Right Infant Car Seat because it covers a lot of what you need to know to make a good purchase. Read that article here. I love watching videos produced by The Baby Cubby. Their YouTube channel has 34 videos about car seats alone! It’s helpful to see how different companies choose to market their seats. It’s also nice to see which features and specifications they see as selling points. In general, you’re not going to see what the pain points are by reading the manufacturer’s marketing materials, but I love seeing the car seats from different angles and getting a feel for each company’s values. There are thousands of customer reviews out there. Sometimes I drown in them and would prefer to hear an authoritative voice to a random person’s opinion. But I do like to scan through reviews to get a sense of common complaints. I take these with a grain of salt because different car seats are going to work for different cars and different families. What one person loves, another person may detest. Did I Find Consensus on the Best Car Seat Advice? In a word, no. There’s not one “perfect” car seat. I feel lucky that we have so many great options to choose from. One website will prefer a certain car seat over another, and one customer will love a seat that won’t work for someone else. Ultimately, I’m going to get either the Chicco Keyfit Air Zip because of it’s high safety ratings and performance fabric, or the Uppababy Mesa for its innovative installation and flame-retardant natural fabric. 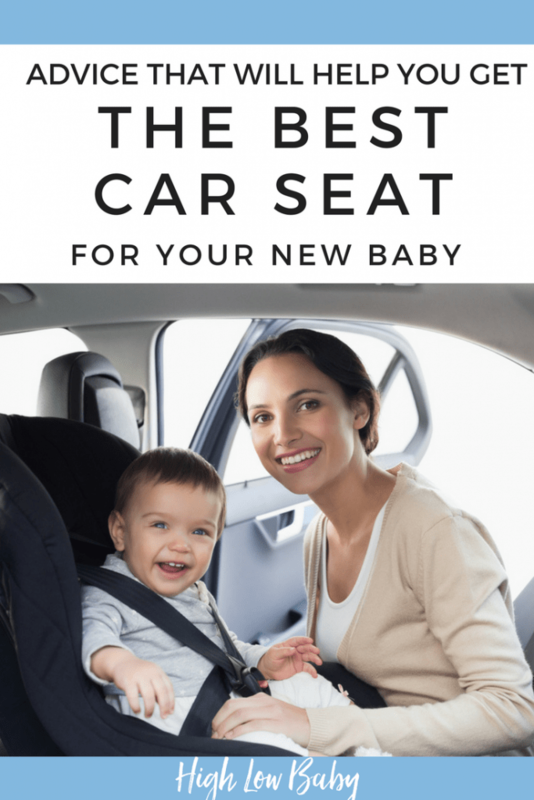 I’m less interested in convincing you that I’ve made the right choice, and instead want to help you find resources that will help you find the perfect car seat for your new baby! If this post was helpful to you, I invite you to share it with your friends on Pinterest!